Vermont Remedial Massage & Sports Clinic began in a small unit behind my parent’s home in May of 2008. With hard work and a growing clientele the decision was made to expand and move to a new home around the corner in Vermont. With the help of family and friends, we fitted out the new clinic and after a surgical hiatus, Practice Principal Helena Pickering reopened September 2017. 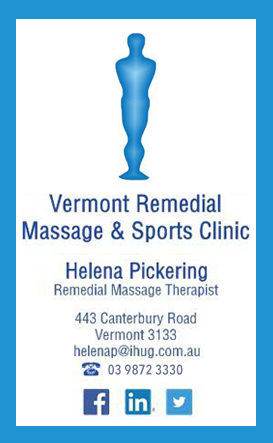 Vermont Remedial Massage & Sports Clinic has quickly established a large network of support within the local community. And in return, the clinic supports a number of local sporting clubs, schools and community businesses. We are a team that is growing. This includes two Remedial Massage Therapists both registered with Australian Association of Massage Therapists. It also includes a Podiatrist who is a member of the APODC. All our practitioners are fully insured. We also engage with a Nutritionist and referral with Exercise Physiologists. Our professional and experienced practitioners provide therapeutic hands-on therapy. A follow-up appointment is recommended (even if you are felling better) to maximize your recovery and minimize the risk of the injury recurring.